This incredibly simple salad makes a great side dish. You can also turn it into a main course by adding smoked chicken slices and chopped roasted peanuts. For the dressing, mix the sweet chilli, soy and fish sauces with the chilli, lime zest and juice, and oil. Leave to one side. Place the noodles in a large heatproof bowl, cover with boiling water and leave to soak for 4 minutes. Drain and refresh under cold running water until cool. Cut the carrot and cucumber into long fine strips. Reserve a few coriander and mint leaves for the garnish, chop the remainder, then toss with the noodles, salad onions and the dressing. 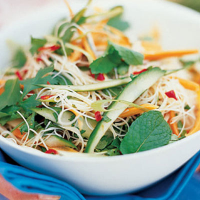 Tip the salad into a serving bowl and garnish with the reserved coriander and mint. Serve immediately.